Monday, May 8: 1:30-5 p.m.
Tuesday, May 9: 10 a.m.-6 p.m.
Wednesday, May 10: 10 a.m.-6 p.m.
Thursday, May 11: 10 a.m.-2 p.m.
Tuesday, May 9: 10:15 a.m.-12:15 p.m.; 2:15-4:15 p.m.
Wednesday, May 10: 10:15 a.m.-12:15 p.m.; 2:15-4:15 p.m.
Thursday, May 11: 10:15 a.m.-12:15 p.m. RAPID, a long-time industry forum for additive manufacturing (AM)and 3D scanning in North America, is now RAPID + TCT, and is headed to Pittsburgh this May. Whether novice or expert or anything in between, attendees will find the event valuable, as on display are the newest products, technologies and materials in 3D printing, AM, 3D scanning, CAD/CAE, metrology and inspection technologies, along with information-packed conference presentations and tours. The event offers the opportunity to engage with the AM community and explore the industry through interactive experiences, more than 290 hands-on exhibits, keynotes and conference presentations from more than 200 industry leaders. Corporate executives and business owners, product-design and R&D professionals, design engineers, manufacturing engineers and managers, software developers, investors, and entrepreneurs will all find beneficial takeaways at RAPID + TCT. Read on for just a sample of some of the exciting companies and technologies on display. See previews of exhibitors’ RAPID + TCT offerings. Ansys topology-optimization functionality lets engineers efficiently design structural components optimized for strength and weight. At the core are solvers that highlight areas of interest, where material is needed to support loads. 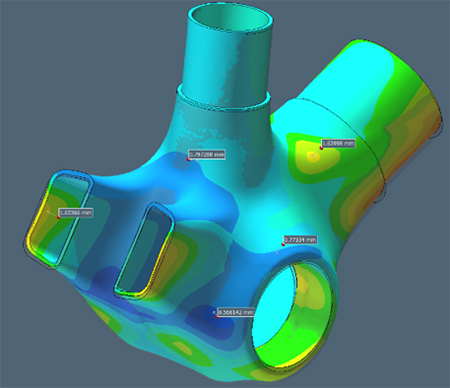 Ansys SpaceClaim also has the ability to clean up, modify or reverse-engineer a topology-optimized STL output. As AM adoption increases, engineers can take advantage of this technology by changing the form of parts and reducing weight while not sacrificing strength. The output is a structurally sound solid-body or STL-print-ready model containing material only where needed. Renishaw is featuring its newly updated QuantAM build file-preparation software dedicated to the company’s metal AM machines. The software features an intuitive workflow and simple navigation, according to company officials. In four steps, from orientation to support, to layout and review, the user can import CAD data and create a machine-ready build file. The software is designed specifically for Renishaw metal AM systems, which incorporate laser powder-bed fusion technology. 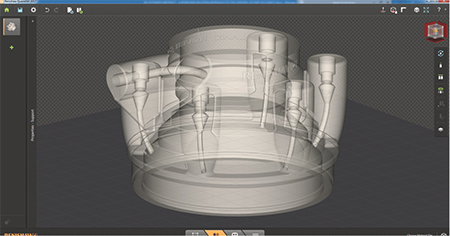 Users can position the parts to be built, then add, import and edit the required support anchors. Multiple components, each with their own material properties, can be efficiently configured on the build plate and reviewed, in slice-by-slice detail, prior to sending the build file to the Renishaw metal AM system. New features include editable angled, tree and cluster supports that can be applied to specific areas of the model for optimum support. Navicube, a navigation tool, allows users to rotate parts and select views. Part clusters, also called stacked parts, can be created to gain the most out of the build volume. Another key new feature: The build file can be edited, allowing parameters to be modified and parts to be added, subtracted or translated down to the laser-toolpath level. Serving as an extension of UL’s Plastics Recognition Program (Yellow Card), UL introduces the Plastics for Additive Manufacturing Program and the UL Blue Card. The program defines the additional requirements necessary to recognize plastics intended for 3D printing and 3D-printed components and products. The Blue Card presents the data necessary to prove the safety, integrity and usefulness of materials intended for 3D printing. 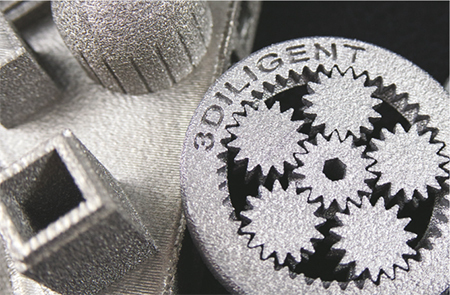 Markforged features its line of industrial 3D printers, known for producing robust parts. Visitors can witness how precision, strength and high surface finish come together in the Onyx carbon-fiber material. The new Metal X printer and its Atomic Diffusion Additive Manufacturing (ADAM) process also are showcased. The ADAM process produces robust, accurate parts across a range of alloys for use in industrial, automotive, medical and aerospace industries. 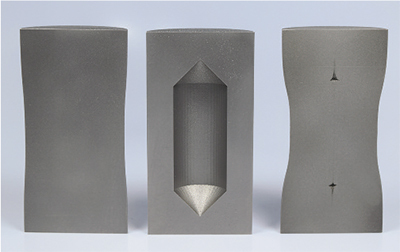 Metal X reportedly offers a cost-effective alternative to more expensive traditional 3D metal-printing processes. Arcam partners with AP&C and DiSanto Technology Inc. (DTI) to showcase electron-beam-manufacturing (EBM) capabilities and metal-powder manufacturing. Visitors also can meet experts from DTI, a full-service medical-device contract manufacturer, to discuss AM of orthopedic implants. 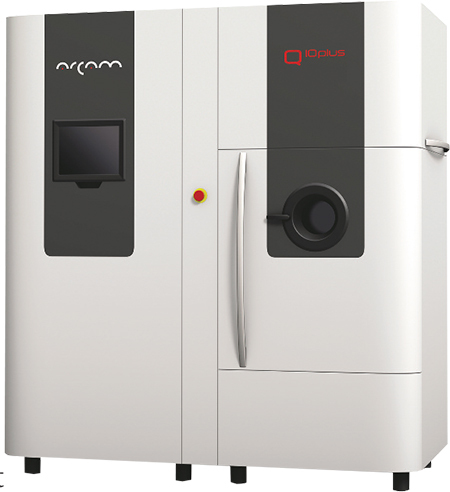 For the first time at RAPID + TCT, witness live demonstrations of the Arcam Q10plus EBM printer (pictured) and understand the new process-validation tools featured in the Qplus-series printers. 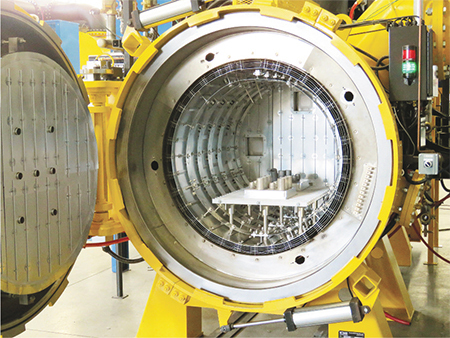 These process-validation tools are the necessary next steps in moving to production for the aerospace and orthopedic markets, according to company officials. Also, learn about the future expansion of AP&C, a manufacturer of titanium powder for AM. Trumpf highlights the new TruPrint 3000 and the TruPrint 1000. Both systems use the process of laser metal fusion to build complex geometries, layer by layer, using a laser and a weldable metal powder. Materials include steels, nickel-based alloys, titanium and aluminum. 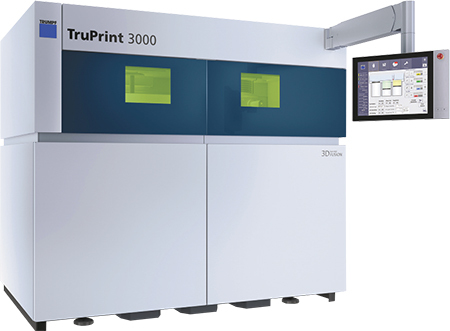 The mid-sized TruPrint 3000 has a working envelope of 300 mm dia. and 400 mm in height, and features exchangeable build and supply cylinders, preheating to 200 C, and external part and powder management. The company offers customers complete 3D-printing packages, including the laser-beam source, machine, services and application consulting. 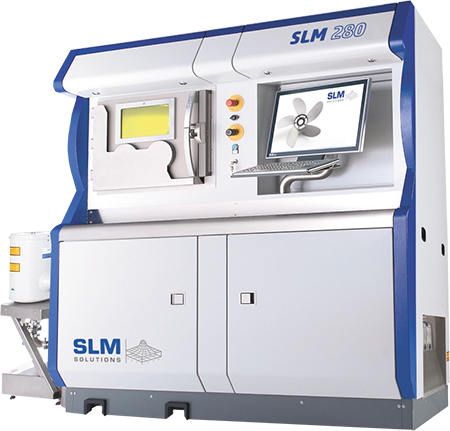 SLM Solutions presents its SLM 280 2.0 upgraded selective-laser-melting system, featuring increased laser power and advanced gas flow. With a build chamber reportedly 23-percent larger than competing machines and twin 700-W lasers, the SLM 280 2.0 promises productive metal AM. The company also unveils its in-process melt-pool monitoring on an SLM 125 machine. As verification of processes and qualification of production components becomes increasingly important, melt-pool monitoring detects thermal emissions from the melt pool in real time and archives the data as part of the build record. Such in-process monitoring improves the build process by allowing builds to be aborted if defects are detected or adjustments to be made during the print. Effective analysis and improvement of build parameters is advanced through the recorded data. At RAPID + TCT, BeAM Machines Inc., Cincinnati, OH, is taking pre-orders for its Modulo five-axis DED (directed-energy-deposition) machine. Making the Modulo unique is its integrated peripherals, according to company officials. Typical DED systems place the required secondary equipment (laser, chiller, fume extractor, etc.) outside of the machine envelope, requiring a considerable amount of floorspace in addition to that occupied by the machine. The Modulo fully integrates all required peripherals into the machine cabinet, significantly reducing the total required floorspace. EOS North America highlights its vision for the factory of the future through its end-to-end AM solutions and services. On hand is the EOS Additive Minds consultancy group, which collaborates with customers throughout the AM experience. Onsite, EOS is running its M290 and M100 metal printers. EOS also is participating in the Medical Manufacturing Innovations (MMI) series, spotlighting exactly how AM can manufacture end-use medical devices and create personalized implants for patients. 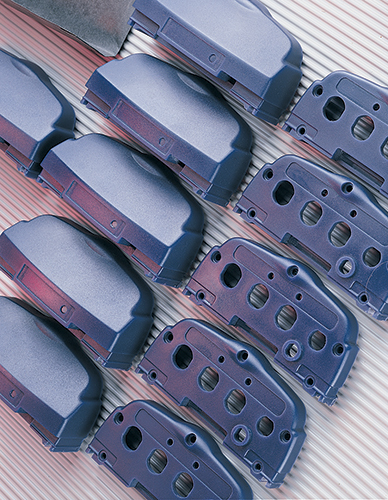 EOS also shares the results from a recent whitepaper with C&A Tool that underscores how AM manufacturing can meet or exceed industry standards for mechanical integrity and part density in tooling. In addition, EOS executives are speaking at RAPID + TCT on a variety of topics. Solar Atmospheres provides commercial vacuum-heattreating services for 3D metal-printing technologies. Its vacuum furnaces can produce the critical temperature uniformity (+2 F) when needed and the vital heating and cooling data by thermocoupling parts directly. Additionally, the vacuum-heattreating process has the ability to attain the vacuum levels necessary to produce clean, oxide-free results. Sintavia provides independent metal AM in support of critical industries. Its hot-isostatic-pressing (HIP) technology applies high pressure and high temperature in tandem to eliminate internal voids in AM components, thus achieving 100-percent density and improving fatigue resistance. To demonstrate this, the company is displaying an artificial pore it created, which shows what happens to internal voids when high-pressure heattreatment via HIP is added to the metal AM process. Shown in the photo (left to right) is the cross-section of a HIPed cylinder with powder inside; a non-HIPed cylinder with an artificial pore; and a cylinder emptied of powder prior to the HIP cycle. 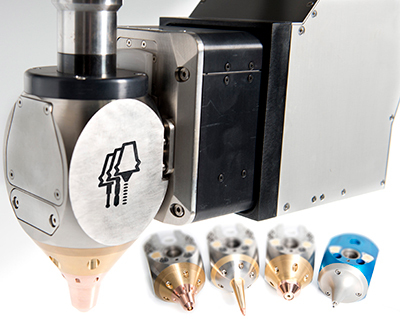 Concept Laser designs and manufactures powderbed-based laser metal AM systems. On display: the M2 Cusing machine, known as the workhorse of the Concept Laser systems and designed to deliver flexibility. Ideal applications include serial production and materials R&D. Visitors also can learn about Concept Laser’s new M Line Factory-series machines, designed with a modular architecture and two independent machine units that allow for simultaneous setup, dismantling and part production. Methods Machine Tools Inc., a supplier of precision machine tools, 3D-printing technology and automation, showcases an innovative automation cell. 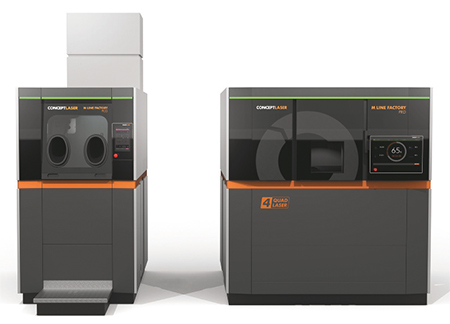 Designed to boost 3D-manufacturing throughput, the unique cell combines AM with robotics and subtractive processes to provide rapid, efficient finished-3D-part production. The 20-ft.-long lights-out cell includes a 3D-printed product in-feeding station, which shuttles 3D parts on build plates into a Fanuc C600 EDM machine that makes a cut between the parts and build plates. In the next station, a Fanuc robot snaps the plates from the printed parts and transfers the parts to a Fanuc RoboDrill for a final machining operation. Stratasys Direct is one of the world’s largest 3D-printing and advanced-manufacturing solutions providers. Its engineering and management teams specialize in aerospace, medical and transportation component manufacturing and are experts in a range of 3D-printing technologies. 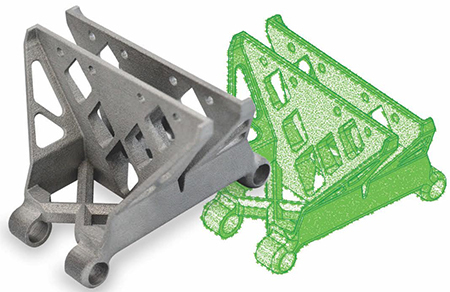 Inhouse additive metal capabilities utilize direct metal laser sintering and a full suite of post-processing machines to deliver high-quality metal production parts. The company maintains ISO 9001, AS 9100 and ITAR certifications. Proto Labs highlights PolyJet technology, which provides product designers and engineers with the ability to manufacture elastomeric and overmolded prototypes without investing in tooling. Product developers can leverage PolyJet to create 3D-printed parts comprised of elastomeric and rigid materials in multiple colors. Material selection includes multiple Shore-A hardnesses and rigid materials. PolyJet parts exhibit smooth surface finishes and can support complex geometries with flexible features. Besides Polyjet, Proto Labs’ 3D-printing services include stereolithography, selective laser sintering and direct metal laser sintering. 3D-printing and short-run-manufacturing provider Forecast 3D has been helping engineers bring their projects to life since 1994. With eight AM technologies and the high-quality craftsmanship, Forecast 3D produces functional prototypes and end-use parts for any industry. At RAPID + TCT, the company showcases its newest technologies: HP’s Multi Jet Fusion (MJF) for printing parts reportedly 10 times faster than SLS, and the latest DMLS/SLM additions for building additive metal parts. Witness functional prototypes and urethane castings in a variety of plastic and metal materials, all produced using the latest in 3D-printing and RTV Casting technologies. 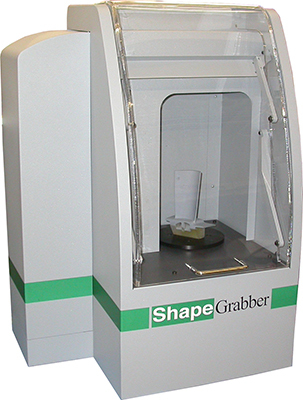 ShapeGrabber 3D scanners allow users to measure complex parts quickly, easily and accurately in minutes, not hours, according to company officials. Unlike traditional methods that capture a few points, ShapeGrabber scanners reportedly capture complete 3D part information. Production staff can make rapid pass/fail decisions, and designers can receive accurate feedback on prototypes with confidence that the entire part has been inspected. 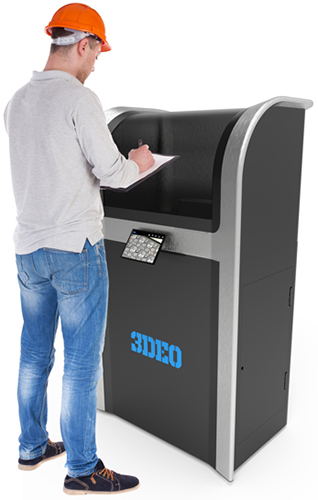 Using the Ai310 automated 3D scanner, automotive, aerospace and other industries are inspecting metal castings, stampings and more. 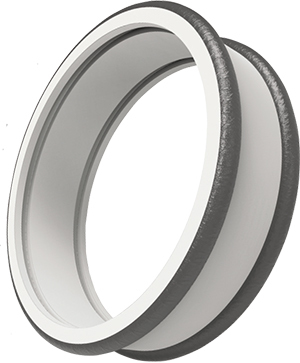 3DEO, a supplier of complex metal parts in high volumes to a variety of industrial customers, showcases Intelligent Layering, a novel metal-AM technology that unlocks the potential of high-volume AM with low part cost, according to company officials. Despite the low cost, 3DEO parts meet the MPIF 35 industry standard while achieving tight tolerances and impressive surface finish. In business for 46 years, machine shop C&A Tool services aerospace. medical, fuel systems and industrial markets, and can handle prototypes to production for traditional subtractive manufacturing as well as AM. With more than 700,000 sq. ft. of manufacturing space, 600 employees and three facilities in Northern Indiana, the company adopted the AM-printing technology from EOS more than nine years ago. Currently with eight EOS Machines, the company maintains two M290 machines for titanium only production and designed for growing production parts. C&A also houses several metrology labs and an Atos blue-light scanner. Certifications include ISO 13485, ISO 9001, ISO/TS 16949, AS 9100 and NADCAP for EDM; C&A Tool also is FDA-registered. Met-L-Flo Inc. uses AM for low-volume production of specialty products, aiding clients from concept through to fully inspected and documented parts. Advanced 3D-printing technologies in conjunction with conventional manufacturing allow for complex geometry with production tolerances. The ITAR- and ISO/ AS9100-certified company produces products from a diverse selection of materials and processes. LPW Technology, a developer, processor and supplier of metal powders and related technology for the AM industry, unveils its innovative PowderTrace powder storage and transport system at Rapid + TCT. Offered as a solution to manufacturers’ demands for traceability and control of metal powders, PowderTrace reduces contamination risk, according to company officials. Transporting and storing as much as 470 kg of powder, the hoppers can monitor weight, humidity, temperature, pressure and oxygen levels. All data can be uploaded into PowderSolve, LPW’s AM quality-control software package, managing data from powders across multiple locations and multiple machines to provide a clear overview of production status. 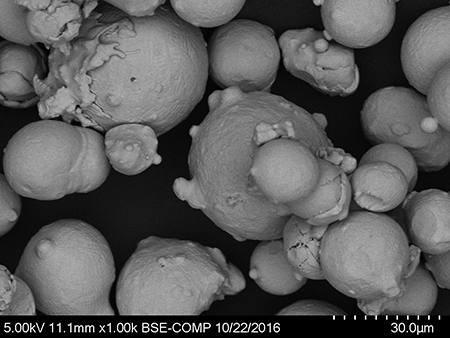 Tekna manufactures spherical metallic powders for AM applications such as powder-bed-fusion (laser and EB) and directed-energy-deposition processes. 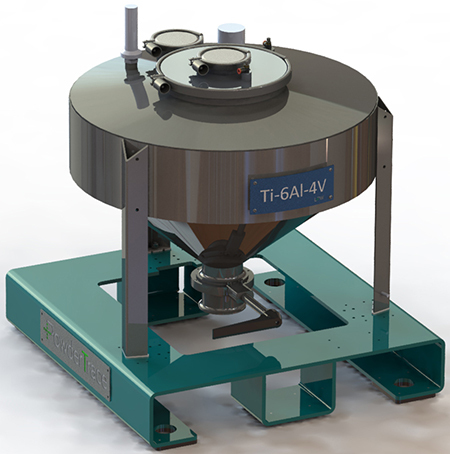 It mainly produces spherical powders of Ti-6Al-4V for medical and aerospace use. These titanium alloy powders have a high level of sphericity and flowability, low oxygen content, high density (bulk and tapped), as well as controlled particle-size distribution. These properties are necessary to make the powders compatible with the most demanding industrial applications. In-Process Quality Assurance (IPQA), developed by Sigma Labs Inc., is a methodology for process control and quality assurance. To further that methodology, the company is launching its next-generation PrintRite3D Inspect 2.0 IPQA software for real-time monitoring of melt-pool metallurgy. The software is cloud-based, enabling users to assure product quality layer-by-layer and part by part on a real-time basis while providing for statistical process control. Proprietary software algorithms extract the relevant feature data of the melt pool, make reference comparisons to a known good baseline thermal cycle, and generate a layer-by-layer and part-by-part quality metric through which product-acceptance decisions can be made. This software release includes new features for process improvement and part validation. Featured data plots include melt-pool heating and cooling rates and peak temperatures. Location mapping for part-by-part discrimination of off-nominal process conditions with 2D and 3D imaging provides for process optimization and anomaly detection. 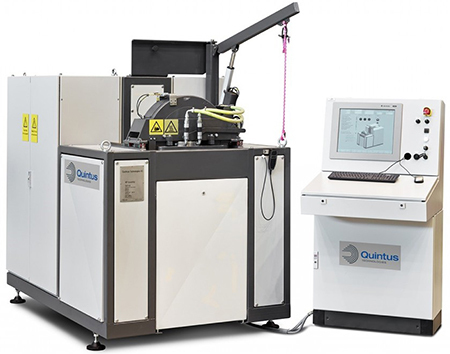 Quintus Technologies’ new QIH 9 hot-isostatic-pressing (HIP) system is used for research in applications for aerospace, energy, gas turbine and other advanced-technology industries. The press holds the distinction of being the fastest and most versatile HIP setup in the United States, according to company officials. Quintus works closely with research organizations and industry to explore the current technical challenges associated with AM and metallurgy components. By utilizing the capabilities of the company’s Rapid Quench process, partners can advance the state of material densification in additive and powder-metallurgy components. NSL Analytical offers complete chemical composition, powder characterization and metallurgical evaluation for AM applications in the medical, industrial, nuclear and aerospace industries. Its technical specialists work with clients to verify feed stock, identify mechanical and chemical properties, and improve the properties of their products. NSL’s team of experienced metallurgists and chemists are actively involved in organizations including ASTM F42 Committee on Additive Manufacturing, NADCAP, SAE, ASM, AMC and SME. The company’s inhouse laboratory is equipped with the latest in analytical tools for powder characterization and product evaluations specific to AM applications. MSC Software’s comprehensive product portfolio encompasses an array of simulation solutions for the engineering community. The company’s Digimat-AM (plastics/composites) and Simufact AM (metals) are used to perform a detailed analysis of materials on both the micro- and macroscopic level. Their models are used to provide the means to combine processing simulation with structural FEA. The overall objective is to move toward more predictive simulations by taking into account the influence of processing conditions on the performance of the finally produced part; the result is a first-time-right print. 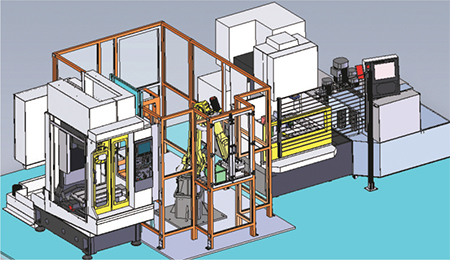 Hybrid Manufacturing Technologies showcases the new Ambit Series-7 multi-task system, which elevates machine tools and robots to hybrid platforms that feature AM. Automatic changeover from adding metal to cutting and inspecting it enables the freedom of additive with the precision and accuracy of machining, according to company officials. The system provides seamless integration of seven production technologies along with built-in thermal and optical process monitoring. Also, reportedly for the first time, post-deposition metal quality can be verified in situ using Ambit tool-changeable eddy-current inspection heads, for detecting surface and subsurface cracks and voids. 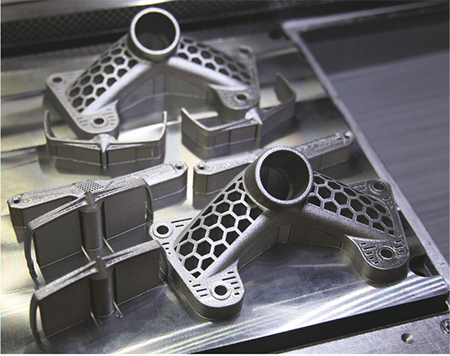 GPI Prototype is exhibiting a variety of 3D-printed metal parts for various industries including medical, defense, aerospace, industrial and consumer goods. Its booth also showcases the various alloys GPI Prototype can print, including aluminum, stainless steel, titanium, Inconel and cobalt-chrome. The company, with more than nine years of experience in 3D metal printing, has nine metal-AM machines at its Lake Bluff, IL, facility for prototype and short-run production. 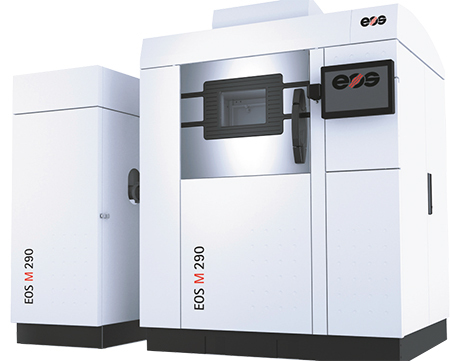 It operates DMLM (direct metal laser melting) machines from EOS and 3D Systems. As a provider of rapid-manufacturing services, 3Diligent offers CAD/CAM-based processes such as 3D printing, CNC machining and casting using work materials that include resins, plastics and metals. The company’s services are accessible through its secure web portal. 3Diligent utilizes data science to identify optimal solutions for rapid-manufacturing projects and a network of qualified partners to deliver the high-performance parts quickly and affordably, according to company officials. The company recently released its State of Professional and Industrial 3D Printing report. Get a lot of knowledge. Hope to have more to share.